Empty Cross, Empty Tomb, Risen Lord: Alleluia! Our parents tell us many things, and my parents often told stories about their growing up, their families and friends, the things that were important to them. Both of my parents were good at telling stories, and I loved to listen. My Mom’s father was a Lutheran Pastor. There were 13 children in his family, eight of them were boys, and four of those boys grew up to become Lutheran Pastors. Her Dad taught her the Catechism of the church — the Ten Commandments, the creeds, and raised her, along with her sister, to commit to memory many texts of scripture, hymns, and prayers. 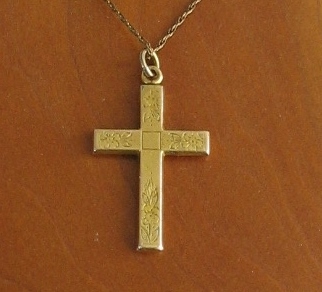 As a wedding gift to his wife, my mom’s father gave her mother a gold cross necklace. 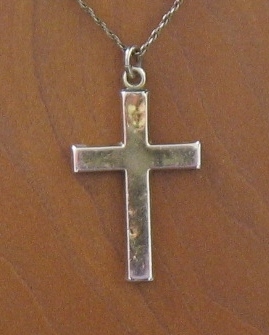 On my wedding day my mother gave that cross to me. The expression to cut one’s teeth on something means to begin to learn about something. It is sometimes literally true. My mother cut her baby teeth on that empty gold cross. The tiny dents all over the back of the cross bear witness to that fact. She didn’t know it yet, but it was the beginning of her education that the crucified Christ was no longer on the cross. 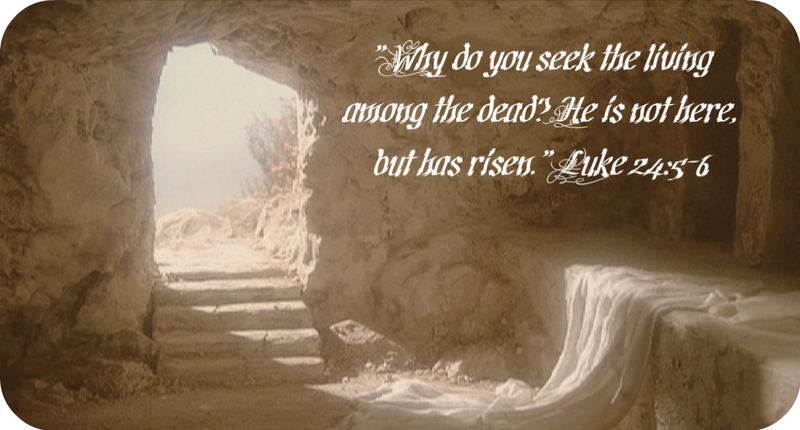 That he had, in fact, Risen from the tomb. We have many things for which to give thanks. I am thankful for that gold necklace which serves as a reminder of my grandparents and my mom, but more than that, tells a larger tale. It is an empty cross, and for that, we give thanks to God. Our Lord has conquered death: Neither Crucifixion nor the grave could hold Him. Alleluia, Alleluia! This entry was posted in Family, Heaven, Love, Marriage, Sacrifice and tagged Celebrate, Easter, God, Heaven, Love. Bookmark the permalink.